The Audi A8, already held in high regard as the automaker’s flagship in the full-size luxury sedan world, steps up its game even further for 2012. Performance, class and technological advances have been just a few of the vehicle’s trademarks in recent years, and Audi keeps marching forward with the 2012 Audi A8. Audi pairs up performance and pampering just about as well as anybody in the game with the 2012 Audi A8, the experts note. 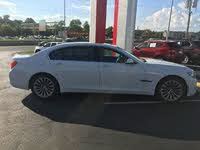 They cite its acceleration and the comfortable ride it delivers, for either a jaunt around town or a cross-country cruise, and note that despite being a bit on the heavy side (even with an all-aluminum frame it pushes 4,500 pounds), it’s a fun car to drive. Experts approve of the vehicle’s ability, helped by Audi’s Quattro all-wheel-drive system, to handle curvy roadways. Fun to drive, fun to be driven around in. Heck, one reviewer points out that the individual seats in the rear of the 2012 Audi A8 L especially are so roomy and plush – options for the right-side seat include a footrest, while the lucky person on the left gets massage and recline functions – that both seats up front may end up going to the folks who draw the short straws. The A8, it seems, may singlehandedly eliminate the fight over riding shotgun. Audi offers the A8 in three trims, the A8 Base, L and L W12. The Base and L are powered by a direct-injection 4.2-liter V8 that makes 372 horsepower with 328 lb-ft of torque and is good for 17 mpg city/27 highway. The W12 gets a 6.3-liter 12-cylinder engine, also with direct injection, at 500 hp. The A8 L rates 16/23 with the W12. The A8 L versions have an extended wheelbase that's 5 inches longer than the regular A8's. All come with an 8-speed automatic Tiptronic transmission. Reviewers appreciate the classy yet understated looks of the 2012 Audi A8, but the high-tech goodies the manufacturer loads into the vehicle are the real eye and attention grabbers. The A8 L comes with heated front seats, powered everything and a navigation system. The navigation and sound systems can be controlled by voice commands or a touchpad, much like that of a laptop computer. Audi sends the A8 out with a perfectly fine Bose sound system with an MP3 player, 6-CD changer and 12 speakers, but stereo aficionados can also opt for a Bang & Olufsen surround sound setup with a 1,400-watt amplifier and 19 speakers. A solar-panel sunroof, dual-pane security glass, ventilated and massaging seats, and a rear seat entertainment center with a pair of 10-inch screens and individual audio controls are among the other options. Pampered enough? Some reviewers do think the tech attack is a bit overdone and running the ship, er, car – the 2012 Audi A8 has a shifter that is designed to simulate the throttle on a high-end yacht – can be almost overwhelming. Audi long has scored well in crash tests and continues to address safety with the 2012 A8. It comes with 4-wheel disc brakes, ABS, brake assist, traction and stability control, an in-trunk emergency release and a full array of airbags. What's your take on the 2012 Audi A8? Users ranked 2012 Audi A8 against other cars which they drove/owned. Each ranking was based on 9 categories. Here is the summary of top rankings. 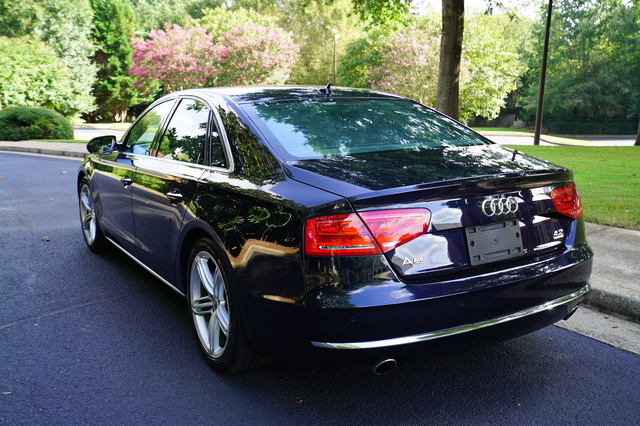 Have you driven a 2012 Audi A8? How Do You Rate A Deal As Fare Deal?